Madison M. studies violin with Ms. Jennifer and attends Vangorden Elementary School. 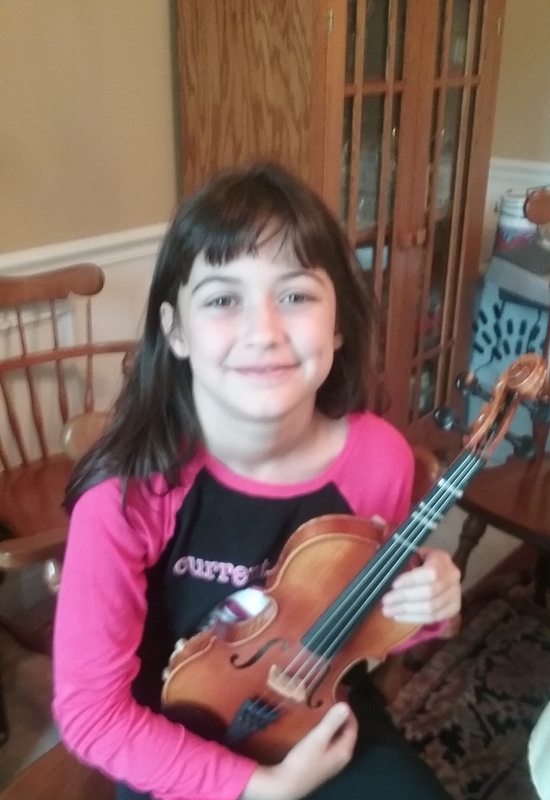 Ms. Jennifer chose Madison for the Student Spotlight, because she works very hard to play well and pays very close attention to her sound quality and intonation. Here is what Jennifer had to say about her wonderful student, Madison! Madison has improved so much in her intonation and using her ear to correct tuning instead of relying solely on her eyes to see if she is on her tape. I am proud of her for how hard she works and for all she has learned. She is such a conscientious, hard-working musician and I am lucky to be her teacher! Madison likes to play review songs, stating that "It's fun! It builds confidence and allows you to see how far you have come in your playing." Madison also sings her music and listens to recordings of her pieces. Her Mom helps her to hear what her music should sound like and is very supportive in Madison's improvement. When she practices, she says "The most important thing to remember is to RELAX. Try to make it as easy as you can. Take breaks. Think of a fun way to play the piece!" The hardest thing for Madison is sight-reading and starting a new piece. It is sometimes difficult to learn the new notes, but Madison has been sight-reading in her lessons and often plays songs like The Irish Washerwoman to keep it interesting and to work on her sight-reading skills. In addition to playing the violin, Madison sings in the children's choir at her church. So far, her favorite Suzuki song is Etude because she says it's fun! She is currently working on Minuet 3 in Book 1. Keep up the good work, Madison!